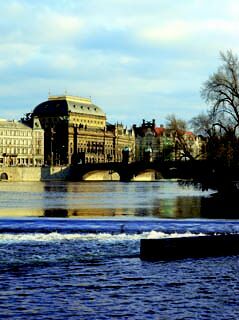 The National Theatre in Prague belongs to the most important Czech cultural institutions with a rich artistic tradition which was created and maintained by the most distinguished personalities in Czech society. This tradition helped to preserve and develop the most important features of the nation � the Czech language and a sense for a Czech musical and dramatic way of thinking. 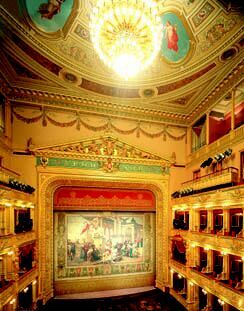 Today the National Theatre consists of three artistic ensembles � opera, ballet and drama � which alternate in their performances in the historic building of the National Theatre, in the Theatre of the Estates and in the Theatre Kolowrat. All three artistic ensembles select their repertoire not only from the rich classical heritage, but in addition to local authors they focus their attention on modern world output. The National Theatre is the embo-diment of the will of the Czech nation for its national identity and independence. Collections of money among the broad masses of the people facilitated its construction and so the ceremonious laying of the foundation stone on May 16, 1868 was tantamount to an all-state political demonstration. The idea of building a dignified edifice to serve as a theatre matured in the autumn of 1844 at the gatherings of patriots in Prague and began to by implement by an application submitted by Franti�ek Palack� to the Provincial Committee of the Czech Assembly on January 29, 1845 having requested �the privilege of constructing, furnishing, maintaining and managing� of an independent Czech theatre. The privilege was granted already in April 1845. 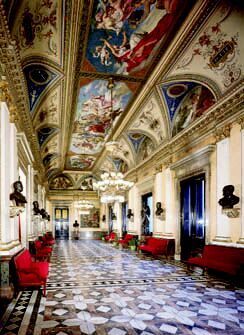 But it was not until six years later � in April 1851 � that the founding Society for the Establishment of a Czech National Theatre in Prague made the first public appeal to start a collection. A year later the proceeds went toward the purchase of land belonging to a former salt works covering an area of not quite 28 are which, fair enough, determined the magnificent site of the theatre on the banks of the river Vltava facing the panorama of Prague Castle, but at the same time the cramped area and trapezium shape posed challenging problems for the designers of the building. 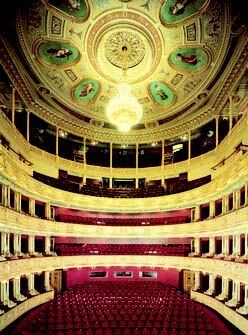 The era of Bach absolutism brought to a halt preparations for the envisaged theatre and supported the concept of a modest provisional building which was erected on the south side of the theatre parcel by architect Ignac Ullmann and opened on November 18, 1862. The building of the Provisional Theatre then became a constituent part of the final version of the National Theatre; its outside cladding is visible to this day in the elevated section of the rear part of the building and the interior layout was only obliterated following the latest reconstruction of the National Theatre in 1977 - 1983. Simultaneously with the realization of this minimal programme asserted by F.L. Rieger and the Provincial Committee the young progressive advocates of the original ambitious concept of the building (Sladkovsk�, Tyr�, Neruda, H�lek) launched an offensive. In 1865 these men attained leading positions on the Society and requested the thirty-three-year old professor of civil engineering at the Prague Technical College, architect Josef Z�tek to draft a design for the National Theatre. He then came out on top in a later declared open competition and in 1867 actual construction work began. On May 16, 1868 the foundation stone was ceremoniously laid, and in November the foundations were completed, In 1875 the new building reached the full height and in 1877 the theatre was roofed over. As of 1873 there was an on-going competition for the interior decoration of the building whose scenario had been elaborated by a special commission under the leadership of Sladkovsk�: the themes were on the one hand in the spirit of the Neo-Renaissance concept of a classic building, on the other hand they were inspired by the current enthusiasm for Slavonic mythology and the stories of the Manuscripts � both these concepts were based on M�nes� paintings and connected with the contemporary style of romantic landscape painting (also linked to Czech history), providing the fundamental ideology guiding artistic expression which to day is described as the art of the generation of the National Theatre. The National Theatre was opened for the first time on June 11, 1881 to honour the visit of crown prince Rudolf. Another 11 performances were presented after that. Then the theatre was closed down to enable the completion of the finishing touches. While this work was under way a fire broke out on August 12, 1881 which destroyed the copper dome, the auditorium and stage of the theatre. The fire was seen as a national catastrophe and met with a might wave of determination to set up a new collection: within 47 days a million guldens were collected. This national enthusiasm, however, did not correspond to the behind-the-scenes battles that flared up following the catastrophe. Architect Josef Z�tek was no longer in the running and his pupil architect Josef Schulz was summoned to work on the reconstruction. He was the one to assert the expansion of the edifice to include the block of flats belonging to Dr Pol�k which was situated behind the building of the Provisional Theatre. He made this building a part of the National Theatre and simultaneously changed somewhat the area of the auditorium to improve visibility. He did, however, take into account with the utmost sensitivity the style of Z�tek�s design and so he managed to merge three buildings by various architects to form an absolute unity of style.